Every custom made Hawaiian jewelry is believed to have a hidden meaning pertaining to the ancient time. That is why this Hawaiian Jewelry is well retained by its natives who pass on its significance to the next generations. And, such is the significance of a fish hook necklace also. The Hawaiian fish hook necklace is commonly known as Makau. As its design suggests, this handmade Hawaiian Jewelry symbolizes a connection between the wearer and the ocean. The jewelry is a symbol of energy, strength, prosperity, abundance, and good luck. 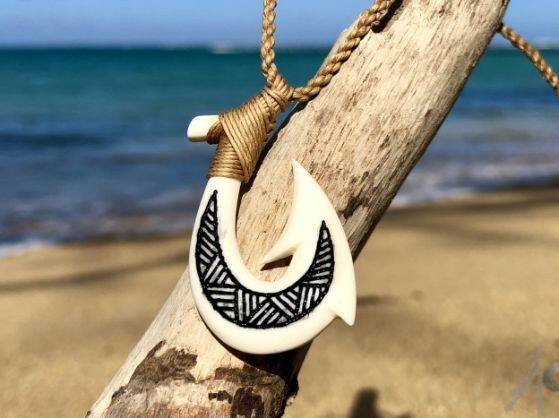 Since the ancient Hawaiian livelihood was very much dependent on the ocean waters, so, the fish hook necklace signifies a deep respect and love towards the oceans. As per the ancient Hawaiian belief, it also signifies that once it is worn, the fish hook becomes a part of the wearer’s spirit. Hence, on being handed over to anyone in the wearer’s family, it establishes a sacred, spiritual link between the closed ones and bridges the gap between time and distance. Therefore, this handmade heirloom Hawaiian Jewelry forms a very integral part of a family throughout the generations. Besides, signifying the great reverence of the Hawaiians for the sea/ocean waters, the Hawaiian fishermen, especially anglers, are wearing this fish hook necklace since the ancient times. This signifies the strength and determination that a fisherman needs for a good catch. According to a Hawaiian tradition, the jewelry has sustained and thus, saved many lives in the past by providing a great catch. It is also believed to have fished up many Hawaiian Islands. Also, Makau is considered to be a symbol of good luck and prosperity. Perhaps, this is the reason why it is worn by captains, mates, and especially travelers to ensure a safe journey. At present, this custom made Hawaiian Jewelry is often gifted as a good luck charm to the travelers, tourists, anglers, and the non-anglers. Many even wear it just as a fancy adornment. The pendant of the fish hook necklace is carved out of jade, bone or wood. Usually made from the bone of water buffalo, the Hawaiian bone fish hook necklace is also known as carabao. This is most commonly worn by the Hawaiian natives. One of the most cherished features of this handmade Hawaiian Jewelry is that the white in color bone necklace when worn, it will gradually absorb the body’s natural oil. And, with time, it develops a honey golden hue. It is believed that the more the pendant absorbs the body oil, the more golden it turns and hence, the greater is its treasure value. What a surreal beauty this Hawaiian Jewelry is! Similar Link: Handmade Hawaii Jewelry: The Taste Of Allure For A Trendy You! At present, the fish hook necklace is worn as a beautiful adornment carved out of Koa wood with linings of sterling silver to make it more appealing. Though with the advancement of time, the traditional Hawaiian fish hook necklace has got a bit modern touch in its design and carvings yet it has managed to treasure the ancient Hawaiian meaning behind it. Its significance and purpose still remain the same. Perhaps this has what helped the Hawaiians to keep their Aloha spirit alive.